Macy Stoddard had hoped to ease the grief of losing her parents in a fiery car crash by accepting a job as a private nurse to the wealthy and widowed Alexandria Hallstead. But her first sight of Summerplace is of a dark and forbidding home. She quickly finds its winding halls and shadowy rooms filled with secrets and suspicions. Pete turned the knob and the enormous front door swung open soundlessly. We stepped into a large, sparse foyer. The floor had an intriguing harlequin look, with black and white marble tiles set on point in a diamond pattern. A small bench covered in a rich red fabric sat next to the door, and a grandfather clock ticked quietly to my left. A crystal chandelier hung from the ceiling, casting a soft glow over the foyer. Straight ahead was a broad staircase leading to the second story, and next to the staircase a wide hallway stretched toward the back of the house. stopped abruptly, and after a minute a tall, thin woman came into the front hall from the back of the house, wiping her hands on a dingy apron. I looked at her and was struck by how gray looking she was. Her hair, gray and shaggy, hung limply to her shoulders. She had watery gray eyes that looked slightly sunken, and even her skin had a tinge that reminded me of dirty dishwater. “No problem,” he said, and turned to me. “Vali will show you where your room is.” With that, he turned around and left, closing the door quietly behind him. I was left alone with Valentina. reminded me of a hotel, with its closed doors and dim wall sconces. It was chilly up there and I shivered. I glanced up and saw a cavernous space rising to a point above the second-floor hallway. That must be where the weathervane is mounted outside. Valentina finally found the key she was looking for. She inserted the key into the door and swung it open on slightly creaky hinges. The noise made the second floor seem positively haunted. I shivered again, though not from the chill this time. “This here is your room. Your bathroom is inside to the right. If you need something, I’ll be downstairs. Miss Hallstead told me to tell you that you can look around or rest until dinnertime. She is working in her rooms and doesn’t like to be bothered while she’s working. Dinner’s at six o’clock.” With that, Valentina turned her back to me and started to close the door. Then she opened it again and glared at me, her watery eyes narrowing. “Don’t get too comfortable—I don’t think you’re going to be here too long.” Then she was gone. I listened as she clumped down the stairs. After such a reception, I felt thoroughly alone, and I was becoming increasingly apprehensive about this new job. Who doesn't love to settle down into a good mystery rife with suspense and tension. 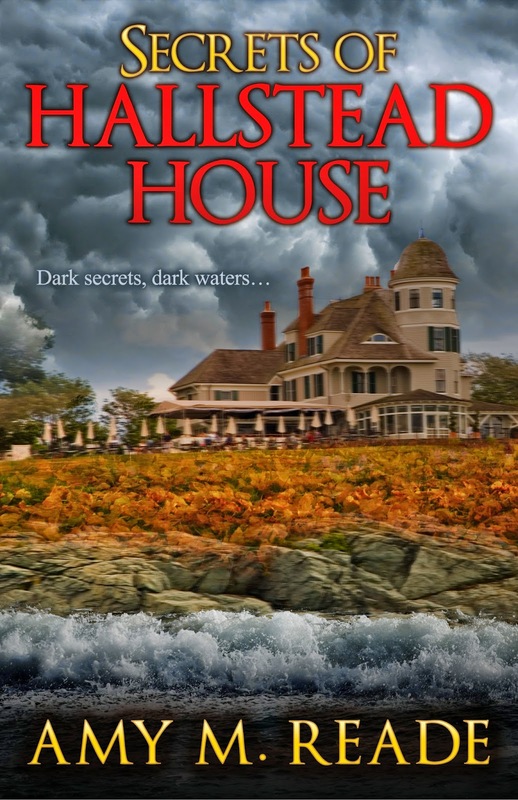 I immediately loved the setting for Amy M. Reade's Secrets of Hallstead House: an old house situated on one of the Thousand Islands, a location I recently visited while on vacation. Macy, the main character, becomes a private rehab nurse to an older woman and it seems once Macy has arrived, nobody in the home is very accomodating to her. Let's cue the creepy music now. The locale offers Macy the ideal situation since she wants to get away from her current life. Being a stranger on an island surrounded by many other islands seems great. Or is it? I won't reveal much or give any spoilers. There's a little romance, a murder mystery, family secrets and some great scenery, including a castle. The story did feel as though it lacked connection in places where scenes didn't transition into others or blend cohesively one from the other. There were some areas where the story needed some of the excessive verbage trimmed to keep the pacing fluid. Some of the dialogue needed tweaking to make it sound contemporary and not droll. I liked the author's writing style and applaud her choice in writing about such a wonderful place as the Thousand Islands. Her love of the area came across in her book and I would pick up her next novel. Cover comment: It's an 'okay' cover. Rather simple. Amy M. Reade is a debut author of romantic suspense. A native of upstate New York, she grew up in the Thousand Islands region and was inspired by the natural beauty of that area to write her first novel, Secrets of Hallstead House. She now lives in New Jersey with her husband, three children, a Bouvier des Flandres named Orly, and two rescued cats who refuse to answer to their names of Porthos and Athos. Upon graduation from Cornell University and Indiana University School of Law, Amy practiced law in New York City, but soon discovered that her dream job was writing. In addition to volunteering with school, church, and community groups, Amy is currently working on her second novel, set in the area around Charleston, South Carolina. Though Amy lives within sight of the Atlantic Ocean, she is partial to the blue waters of the Pacific and spends as much time as possible on the Big Island of Hawaii, which is the setting of her as-yet-unwritten third novel. Kensington Publishers is giving away TWO Ebook Copies of SECRETS OF HALLSTEAD HOUSE at EACH stop on the tour. Like this one. The creepy house particularly. Thanks for hosting me today! And thanks, Mystica, for another nice comment! We thank everyone for commenting.